Already soggy ground could be in for another inundation with the MetService saying there is a high chance of heavy rain hitting parts of the South on Sunday. The Dunedin City Council says it is closely monitoring the forecast and the MetService is predicting rain on five of the next six days. 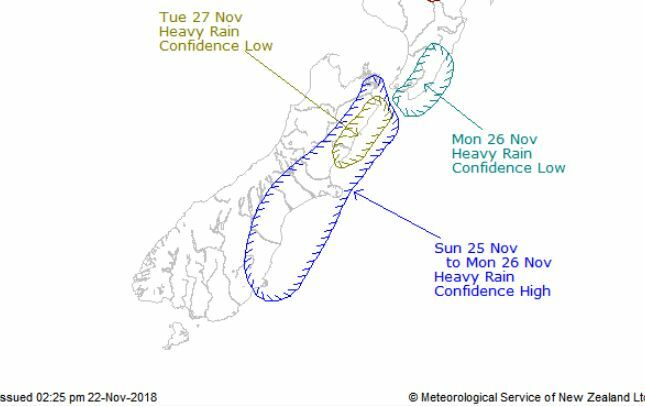 In a severe weather outlook it says there is a "high confidence" those falls will be heavy on Sunday and Monday in eastern parts of the South Island. More persistent rain expected about eastern parts of the South Island - mainly north of Dunedin. However, Dunedin was also included in the area covered by the severe weather outlook. The MetService said a deep low over the Tasman Sea on Friday was expected to extend a trough to the north of the North Island. The trough is expected to move slowly southwards over the North Island on Saturday, then become slow moving over central New Zealand on Sunday and Monday, directing a moist easterly flow over the South Island. On Tuesday, the trough is currently expected to weaken, as the low approaches the North Island. DCC infrastructure services general manager Simon Drew said it was keeping an eye on the forecast. "With more rain expected next week, we are continuing to closely monitor the forecast and conditions," Mr Drew said. This comes as the clean-up is continuing following heavy rain in Dunedin this week. "DCC staff and contractors are continuing to deal with issues caused by the weather. "Most of the floodwater has receded, however high flows and surface water are expected to remain in parts of the Taieri Plain for some time." Middlemarch residents were still being advised not to drink water from private bores as it was likely to be contaminated due to flooding and wastewater surcharges. Samples had been taken to assess water quality. Water is available from a tanker beside the Strath-Taieri Community Centre. Streams in the area remain high and this was still having an impact on the wastewater network. Taieri residents are also being advised not to drink water from private bores as it could be contaminated. The water supply has been restored for residents in Coast Road and Evansdale. However, this morning residents have been affected by a water main burst at Seacliff and another at Ramrock Rd, Waikaouiti. These were expected to be fixed today. Wastewater surcharges had affected some roads and properties around the city. While surcharges have stopped, it is recommended people stay out of all waterways and do not collect shellfish until advised it’s safe to do so. A number of roads remained closed due to surface flooding, mostly in the Taieri and Strath Taieri area, and eight slips have been reported around the city. DCC contractors were busy working to repair roads and infrastructure and work is being prioritised. Sportsgrounds remain closed and the Warrington Domain would remain closed to freedom campers until further notice.